Inside the Studio: Personalized Gift Bags and Treat Bags are Everywhere! This week it appears that an enormous party has hit our offices. Our graphics team’s desks have been loaded with party treat bags, favor bags, lunch bags, petite shopping bags, large gift bags and extra large personalized shopping totes. We are staying calm but with hundreds of Personalized Party Bags everywhere, we are thinking up many new ways to party on! We have been adding images to the site of fabulous new totes and bags and having more fun than you can imagine creating adorable imprint options with our new bag sizes and colors! Personalized gift bags and custom small printed treat bags make the perfect gifting presentation. They are durable, substantial and makes gifting easy! Stash and carry your party favors easily. Package your hostess gifts and your wedding out-of-towner bags in style. 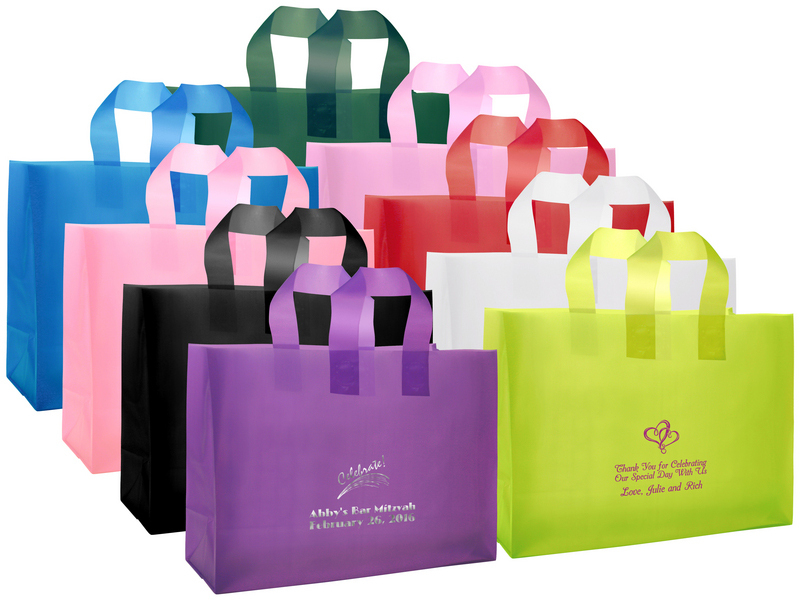 From graduation gifts to birthdays, from Halloween treat bags to bridal showers, from weddings to all those gifts in-between, our personalized bags are ideal. Simply create and design your own bags to reflect your style and add a personal touch to all your gift giving and party giving needs. You can preview what your final product will look like before ordering and have a chance to play with colors and designs to get a perfect look. Create a basic gift bag for your family with an imprint like “Just for You from Susan and Jim” and you can use it for all your gifts. From birthdays to anniversaries to holiday time, it makes wrapping gifts so much easier and actually is more cost-efficient than buying a gift bag each time you need one. We have a perfect size bag options and since the bags are personalized, we save on all those greeting cards (double bonus!). Our printed bags come in two sizes. 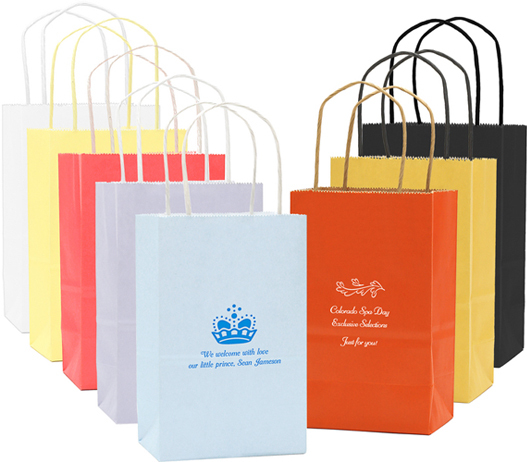 The small printed paper bags size is great for party goodie bags and the medium paper bags are perfect for treats or lunches. If you are looking for a small handled bag, we now offer the new Petite Twisted Handle Gift Bags which perfectly hold jewelry, a gift certificate, gift card or small present with ease. 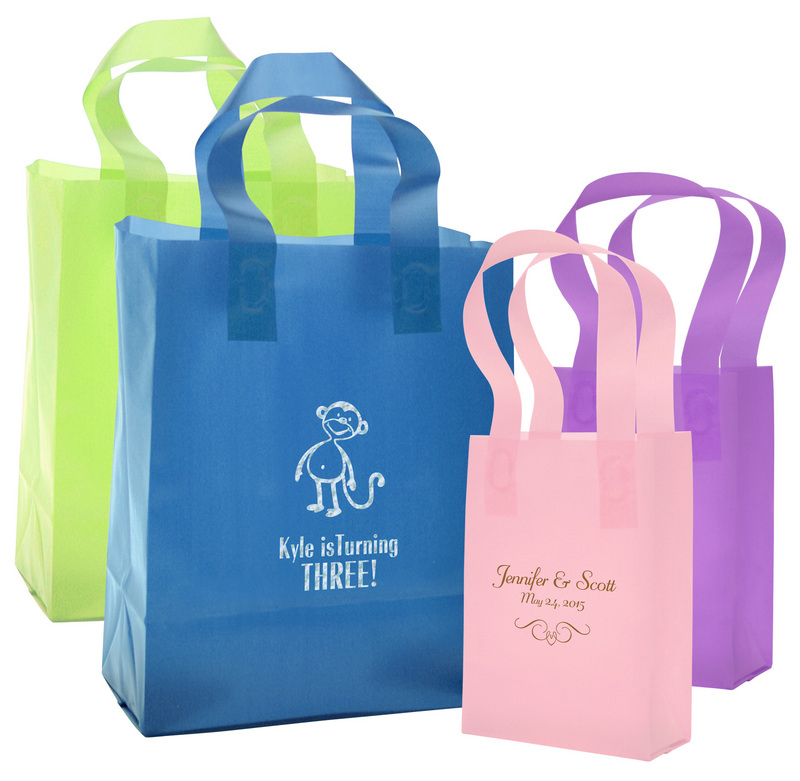 We also have the Design Your Own Twisted Handled Gift Bags which are 8″ x 10″ x 5″ and for a large shopper size we have the Kraft Vogue Shopping Bags which are a generous 16″ x 6″ x 12″ in size. If you are looking for a unique material, try our Frosted Bags with wonderful designs and imprint options. 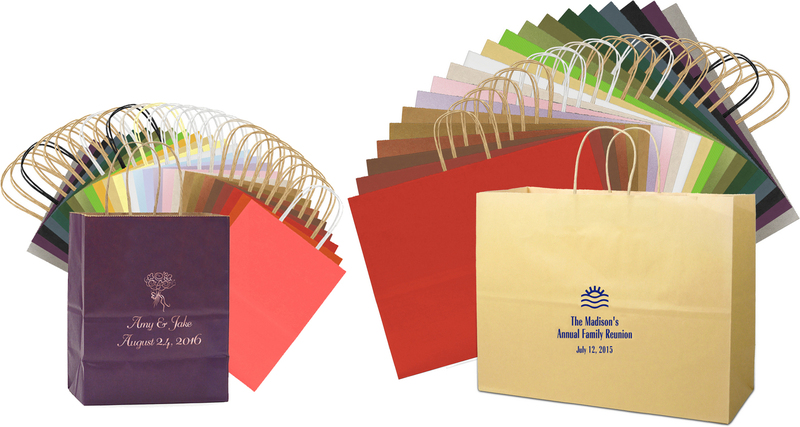 From our Mini Vinyl Shopping Bags at 4″x3″x6″ to our medium Cub Sized Vinyl Shopping Bags at 8″x5″x10″, there is a size that will be perfect for your gifting needs. Our very roomy Vinyl Vogue Shopping Bag are 16″ x 6″ x 12″ in size and are great for a larger gift item. So enjoy. Personalize it. And Party on! Comments Comments Off on Inside the Studio: Personalized Gift Bags and Treat Bags are Everywhere!